The first Sunday of 2015 dawned bright and crisp. In the afternoon, we chased the sun up the hill through what we call ‘our back yard’ (commonly known as Eaves Wood). 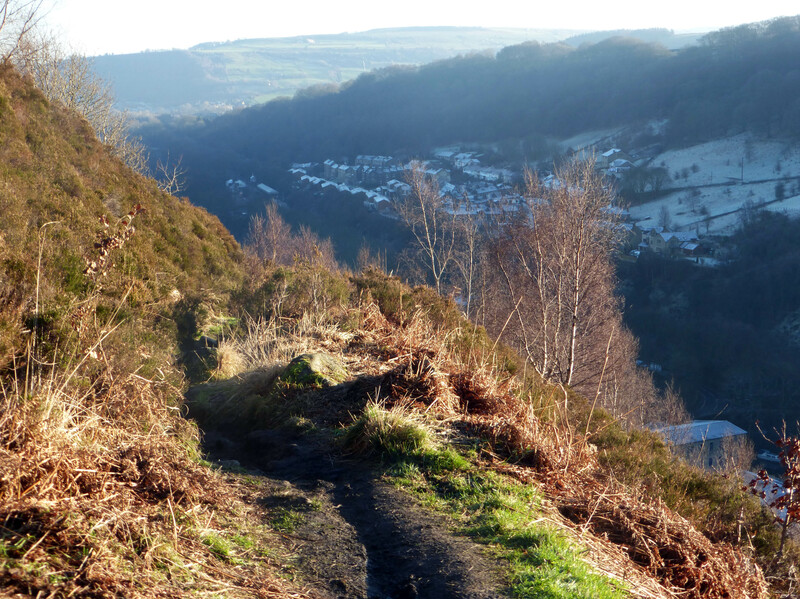 A climb up to Heptonstall road and a left turn, took us to possibly my favourite path along the ridge. I love all the little crevices made by the weathering of the sandy rocks and the numerous minute plants found clinging to the rock face. I could explore this tiny world for hours. From Great Rock we took the precarious steps up and paused at ‘photographers’ corner’ where there was a bit of a lock jam. Not surprising given the views back down the valley across to Stoodley Pike. We then followed the path along, and stopped on one of the flat rocks for coffee, avoiding getting blasted by the icy air. 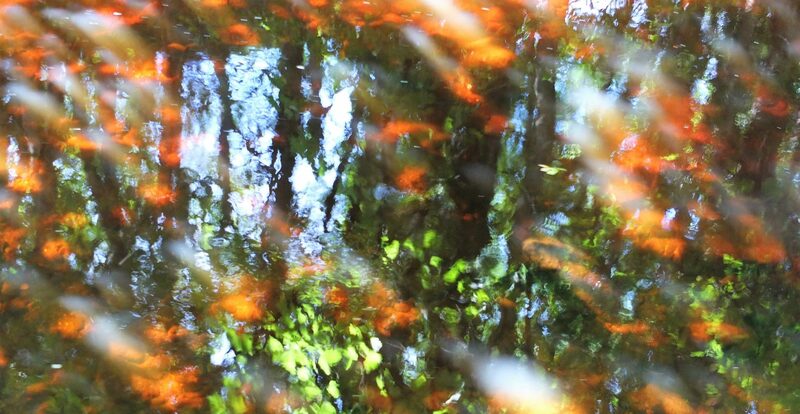 I closed my eyes and felt the bright orange sun on my face – a real tonic. 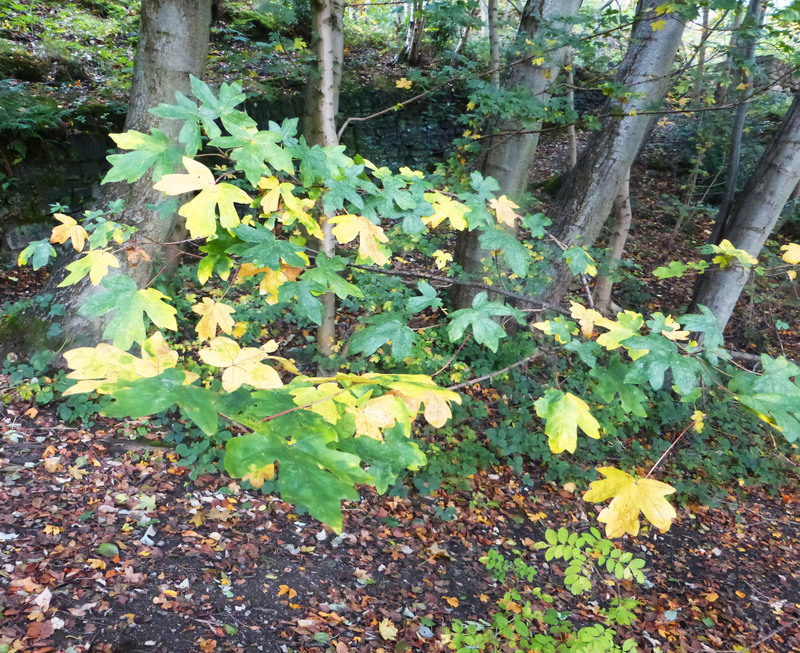 We then carried on as far as the path took us turning right up the lane where we came across the tree planters. We waved in greeting then took the road down into the village. As the light faded, we lingered in the churchyard before setting off to walk back home. We recently discovered a different way up to the woods. I had a vague recollection of taking this less direct route some years before but unfortunately my memories were flawed. We started out along the main road and soon after the Fox & Goose, we took a small flight of steps up. Struggling through brambles and overgrown balsam plants, we came to a dead end and concluded that we had followed a path to a telegraph pole! We retraced our steps. About to go back down to the main road, we noticed an actual path leading further up and thought that might have been the one we had thought we were on to start with. 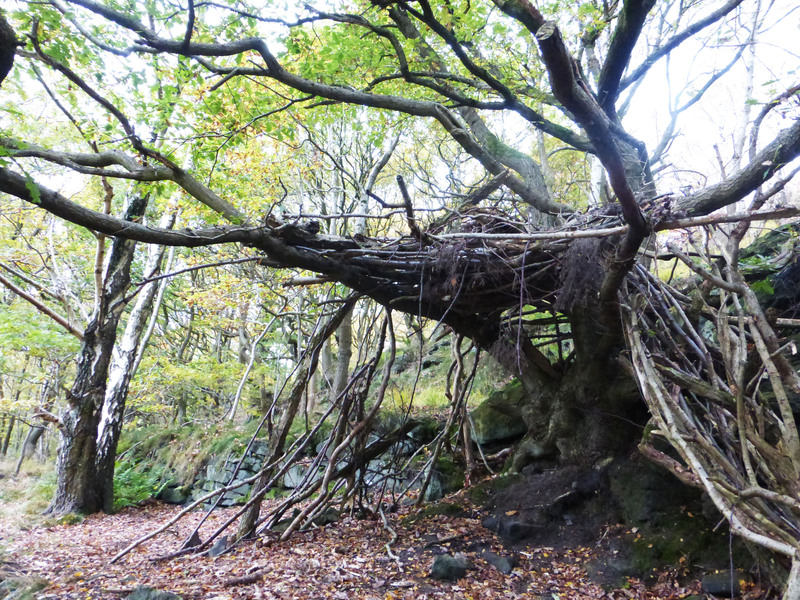 The sight of a woodland den prompted a joke that Ray Mears had been here recently. We followed it up and around until we joined my favourite path from which we had a relatively easy and familiar climb. 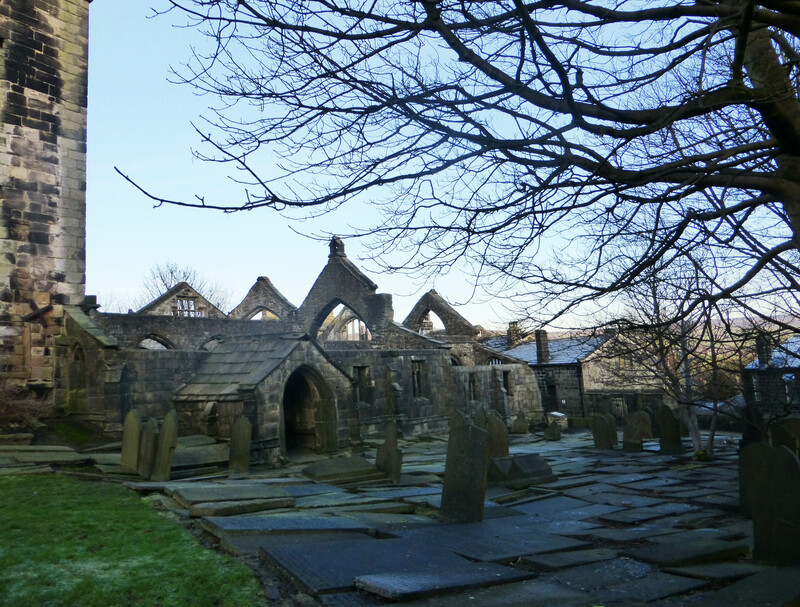 This entry was posted in landscape, photography, walking, woods and tagged autumn, Churchyard, cliffs, den, Eaves Wood, England, Great Rock, Hebden Bridge, Heptonstall, Oak trees, Ray Mears, ridge, rocks, Stoodley Pike, trees, valley, Yorkshire on January 9, 2015 by Hepdene Rose.